Today you will be flying the RC helicopter in a slow controlled circuit around your fixed position. The main goal for today is to get you accustomed to viewing the left and right side orientation of the heli while getting more comfortable with the tail rotor controls. The same pre-flight checks have to be done first before you start, and once again, RC helicopter training gear is a must. A calm day, nice soft grass, and no spectators near you or your helicopter are still the golden rules today. Once again start with the RC helicopter pointing into the wind with you 10-15 feet behind the chopper. 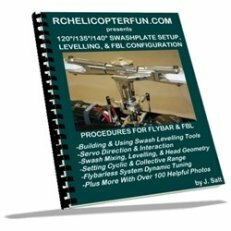 Get into a 3-4 foot hover and turn the nose of the helicopter to the left and slowly start flying the RC helicopter around your fixed position in a counter clockwise direction keeping it 10-15 feet away from you at all times. You will be turning with the helicopter to keep facing it as the heli flies around you - just as if you were flying a line control airplane. 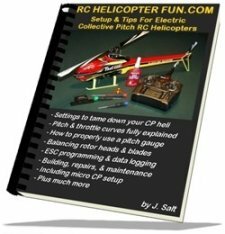 Keep your RC helicopter moving slowly. It should take about 20-30 seconds to make one revolution or circuit around you. That's a nice pace and slow enough that you shouldn't get dizzy. If you do, slow the pace down further. If you are still using your tame learning to hover setup from day's 3,4,5, & 6, today is when you want to switch to a more convention "normal" setup. By day 7, you should be well past the point were you are making "panic low collective stick reactions". If you are not past that point, you are not ready for day 7 yet. Keep practicing day 5 & 6! You don't want to be using a really tame learning to hover setup at this stage since you will be flying higher and faster and you should have some negative collective in your pitch curve or at least zero degrees due to the transnational lift that can be generated. Nothing extreme of course like a full on sport or 3D setup, and you still want a fair a mount of cyclic and tail rotor dual rate reduction since you still want fairly tame cyclic and tail response. If you ever feel like you are getting disorientated while flying the RC helicopter, pivot your body so it is sideways to the helicopter so you are facing the same direction it is pointed. This is almost the same as flying the RC helicopter from behind and will give you a chance to regain your confidence and composure. Fly the RC helicopter counter clockwise circuit around yourself a few times and then land and take a breather. Now do the same exercise, but this time fly the RC helicopter circuit to the right – a clockwise circuit around you. 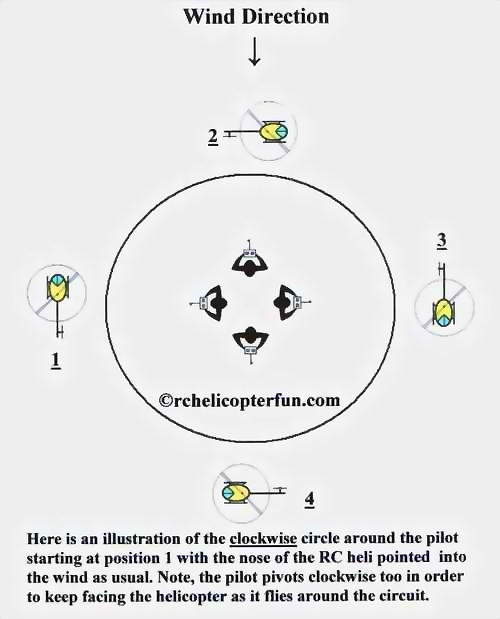 You will most likely find this is more difficult because you will have to hold in more right tail rotor control to keep the helicopters nose always pointing in the direction of the circle. During the left or counter clockwise circuit, you will need very little left tail rotor input to keep the helicopter’s nose pointing in the direction of flight. The reason for this is because of the torque from the main rotor blades wanting turn the helicopter to the left all the time if it were not for the tail rotor to counter act the torque. You might not experience this “one way is easier than the other way” circuit, but most people do, myself included. I must point out this is for a helicopter with a clockwise rotating rotor blade (as we know by now, the most common direction of rotor rotation on all helicopters). 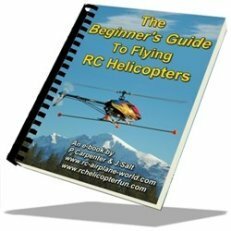 If your rotor blades rotate counter clockwise, you will want to start with a right or clockwise circuit as it will usually be easier than the left counter clockwise circuit. 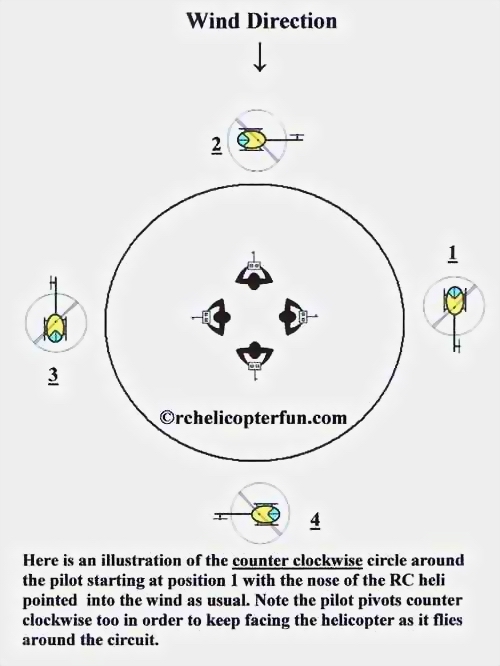 Keep practicing these counter clockwise and clockwise circuits while you stand in the center flying the helicopter around your fixed position. If you find one direction starts becoming much easier than the other, force yourself to perform the circuit direction that is harder. If you don’t, you will find your self always flying circuits in the easy direction. At any rate, keep flying these circle circuits until you are 100% comfortable with them. It will also be a good idea to practice your day 6 RC helicopter lesson of flying that long skinny figure 8. Why? Day 8… large circuits and fast forward flight – this is where the adrenaline starts surging – the risk of doing a lot of serious damage to your helicopter if you make a mistake is very real – take as long as need to get comfortable with days 6 and 7. When you are ready for day 8 – just say the word.